When children are ill, part of the process of getting better includes the food that they eat. If the child doesn’t start to get better after a few days, if their temperature becomes very high, or if they become very withdrawn or listless, consult a doctor. ‘Feed a cold and starve a fever’ is advice that dates back to the 1500s, and may have been a messed-up translation even then. There may be a little bit of truth in it – in a study in Holland, volunteers given a meal showed an increase in the part of the immune system that attacks viruses (viral infections cause colds, amongst other things). Volunteers that fasted showed an increase in an immune response that attacks bacteria (bacterial infections can cause fevers). However, this study was only small, and involved healthy volunteers, so it’s not really enough to base treatment on. 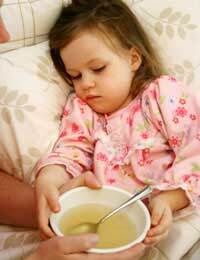 Generally, children with colds or fevers need to eat light and nourishing food to help them fight off the infections. Vitamin C doesn’t prevent colds, but it may shorten the length of the viral infection. Vitamin C-rich foods, like fruit (especially oranges and other citrus fruit) and vegetables, also provide a range of other vitamins and minerals that will help a sick child get better, and fruit can be an easy way to tempt an ill child to eat. Just as an aside, antibiotics don’t have any effect on viral infections, including colds and flu. Being ill can increase a child’s need for protein, so meals for ill children should include tasty and easy to digest proteins from sources such as chicken, fish, tofu (soya bean curd), Quorn, pulses and nuts. Plain rice, plain pasta or mashed potato provides some protein, and is gentle on the stomach for a child who I feeling sick. For all children who are ill, but especially for children with diarrhoea and vomiting, it is very important to keep their fluid intake up, to avoid dehydration. Water and diluted fruit juice is the best option – the fruit juice will give them some energy and nutrients if they are not eating. Oral rehydration fluids are only needed if children actually become dehydrated, and should be used with the advice of a doctor, nurses or pharmacist. Children that are ill may not want to eat, so food should be tasty and tempting. Blocked noses mean that food can seem tasteless, so include distinct (but not overpowering) flavours. Meals are probably best little and often, and being ill can be an excuse for little treats, like exotic fruits and a few sweets or tastes of chocolate, but don’t overdo it. Chicken soup is a traditional cold remedy, and is an excellent choice for an ill child – it’s tasty, so will stimulate a low appetite, easy to digest, includes protein, a few added vegetables supply vitamin C, and the steam from the soup might also make breathing a bit easier. It’s easy to get dehydrated when ill, and the soup provides extra fluids, salt and minerals. For a vegetarian child, a light vegetable broth with a bit of tofu or Quorn is a good alternative.